A week and a half ago, once November had spent a few days settling in, it dawned on me that this is the perfect time to sneak in something I have always wanted to knit but have never managed in past years – the knitted advent calendar. I’ve seen several friends knit these up, in different styles, and it’s always a gorgeous result. These also bring together 2 very enticing prospects: 1) use up stashed yarn leftovers that are just sitting there being otherwise useless, and 2) you get a personalizable advent calendar that you can fill up with whatever you want. Chocolates, notes, tasks, trinkets, anything that helps you do December the way you want to do it. SIGN ME UP, I said. 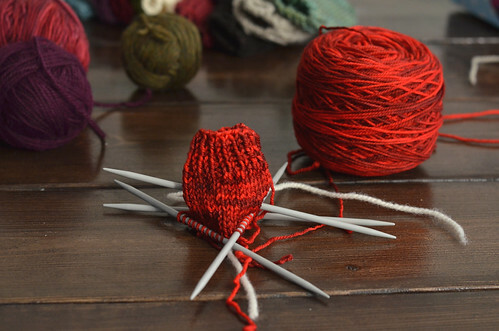 There are a lot of variations of the knitted advent calendar – mittens, mini stockings, pockets, wall hangings, and so forth – but I must say I do like the simplicity of the mini mitten. 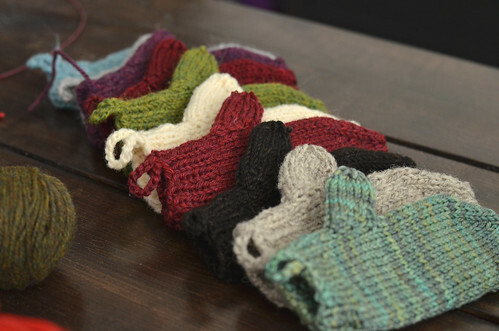 This pattern is the free Advent Mini Mittens from Bernat. I’m finding one mitten works up in about an hour and a half or so, give or take a bit of procrastination time, so basically my aim is one per evening. I’ve elected not to do any stripes or stitched numbers on mine, just keeping it simple and reaching for the red, green, purple, and neutral colours in my stash leftovers of worsted weight and DK. Should make for a nice combination of colour and texture! 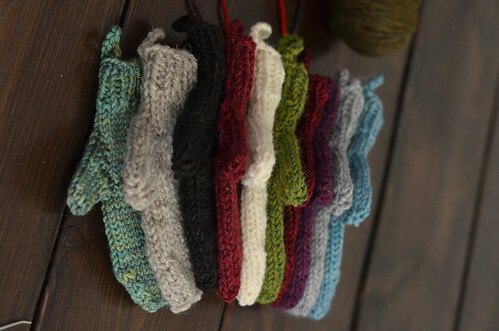 I’m aiming for 24 mittens in total, and am currently on number 11 which makes me almost at the halfway mark with 13 days left in November. This is all eminently do-able, I’ll just have to keep the momentum going. I’m admittedly not knitting on much else at the moment, but I’m cool with that because this meets one of my current goals of knitting more things I’ve never done before. Knitted advent calendar, activate! Hope you have some good holiday knitting plans as well! They are sneaky like that. Until next time! What a wonderful idea! I’m going to download the pattern. Have fun. Remember when you made “cork people” one winter? They cracked me up. My goal is to make an ornament for each niece/nephew and all their kids (for 2018). This looks like my ornament! Thank you. I did a garland with 24 socks, which I gave to my son and his wife. They went pretty fast and I had white angora to use around the top edge of the red sock I knit for Christmas eve (just a hint, suggestion if you have those materials?) It was fun and looks so cheery. Those are so cute! It will be fun to see what you do with them. This is such a cool idea. I’ve been racking my brain to come up with a yarn related advent calendar and this fit the bill perfectly. Good luck with your goals!! Oh wow I can’t believe you posted this!!! I’m thinking of doing something similar!!! I want to knit up something like this for my office at work. They’re adorable, thanks for the pattern heads up. I don’t have time to do mittens for advent but I’ll knit some for friends and gift them with a fancy Lindt chocolate bear inside. Hope you’re well, nest wishes from the UK. Those are so, so cute. They will add to the holiday cheer! How’s the Advent calendar going? Hope you found some lovelies to put in it. My husband gifted me with the Jimmy Beans Wool Craftvent calendar this year. While I’m not super excited about the actual pattern, I’m loving the little surprise every day.